I just want to start off by telling you that you are amazing! Homeschooling, in and of itself, can be quite the undertaking – fraught with challenges. It takes a lot of (dare I say it) courage to choose to take on the task of educating your child full-time. Not everyone would be up for the job. But you are. For that, I commend you! 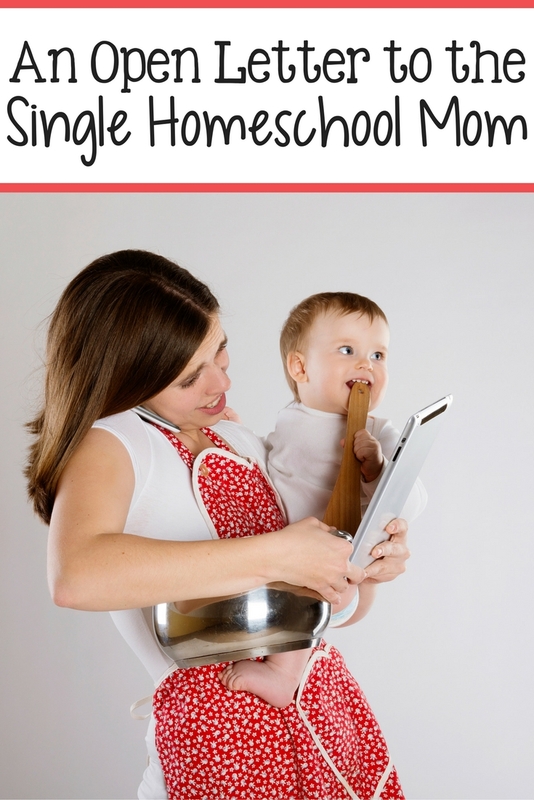 But you have added challenges that other homeschoolers may not have. Perhaps you are doing this without any support at all from your child’s father. I know that I really lean on my husband throughout this whole thing – especially emotionally. I can’t imagine how it may feel to not have that type or level of support. The fact that you are making this happen regardless of whether the other parent is involved shows a level of tenacity that I admire. Not just when it comes to homeschooling, but where it concerns ANY goals you set for yourself. Perhaps you are homeschooling (and raising) your children on a single income. That almost always comes with a bit of stress. Even though I am married, I have definitely been in that situation more than once. But you are making it work! You figure out a way to make ends meet each month (and may be doing fabulously income-wise). However, I can imagine that there are times when you doubt yourself. When you question whether this is the right path for you and your family. When you feel as though perhaps you and your child would be better off if you went the public school route. I bet you can come up with several reasons why public school might be a better fit. You wouldn’t have to deal with people constantly questioning your parenting decisions. Public school is the expected choice, so maybe if you go ahead and enroll your child in public school, people will get off your back. You would have more free time to do other fun things with your kids rather than spending all of your time trying to teach them. You wouldn’t have to stress about whether you are spending the right amount of money on your child’s education. You feel like since you are homeschooling, you are expected to buy your child top-of-the-line educational materials. It would be cheaper to just put them in public school so they can use the resources provided there. You’d be able to increase your income a lot more if you could get a job while your child is in school. Listen, I get it. The struggle with these doubts and fears are real and can be crippling. However, let me assure you of four things. You cannot please everyone. Nor should you try. When it comes down to it, someone is always going to have something to say about the decisions that you make. But you have to embrace the fact that the only people who are genuinely affected by your parenting decisions are you and your children. So the only people who have any right to offer their opinion are….you guessed it – you and your children. If homeschooling feels like the best move to make, then hold on to that confidence and don’t let anyone shake it. The beauty of homeschooling is that you have complete control over how you spend your time. If you want to take the week off and go on a fun family vacation, you can do that – without the attendance police breathing down your neck. If you want to spend your day playing fun yet educational games or going to the science museum, you can do that as well. When you break it down, your kids being in public school means that you only have evenings and weekends available for family time. So, technically, homeschool is what affords you more time freedom. In either situation, though, it really boils down to how you choose to spend your time. If family time is important to you, make it a priority to spend that quality time together, regardless of where your child goes to school. I know it is often easier said than done, but you might be surprised what you can accomplish when you really put your mind (and resources) towards a goal. If you struggle with getting the most out of your day, check out these Time Management Tips. I am sure we can all think of situations where we could earn more money. If we had unlimited time. If we had better connections. If we’d gotten our degree in a different field. If we lived in a different state. But I find that it rarely serves us to think of the “what ifs” that exist. Instead, we should focus on our goals and plot out specific actions we can take to get there. If what you need is more money, figure out how much more money you need. Then brainstorm the various ways you could earn that extra money. In fact, here is an article about 25 Real Work at Home Jobs that you can check out. Perhaps you will find something on the list that is right up your alley. No one can make this decision for you – so don’t let them unmake it. Don’t give in to baseless doubts or fears. Remember WHY you started homeschooling. As long as that reason still exists, chances are homeschooling is still the best option for your family. And if there comes a day that you decide (without fear being the driving force) that perhaps homeschool no longer serves your family, then rest easy knowing that making a new decision does NOT make you a failure. It’s simply a sign that you are always trying to do what is best for the ones you love. So, my friend, here is to you living a life filled to the brim with love, joy, and learning. Homeschooling and Working Outside of the Home: Is it Possible?